Whether you’re looking for an easy day trip from Denver or one of Colorado’s best, family-friendly destinations, head south — to Colorado Springs. Even Colorado residents may be surprised to learn all of the adventures this city holds. It’s known for its Olympics training center and military base, but Colorado Springs can be super playful, too. Where else can you hand-feed a giraffe in the nation’s only mountain zoo; climb through mysterious, ancient caves underground; and leap off a canyon on a zipline? 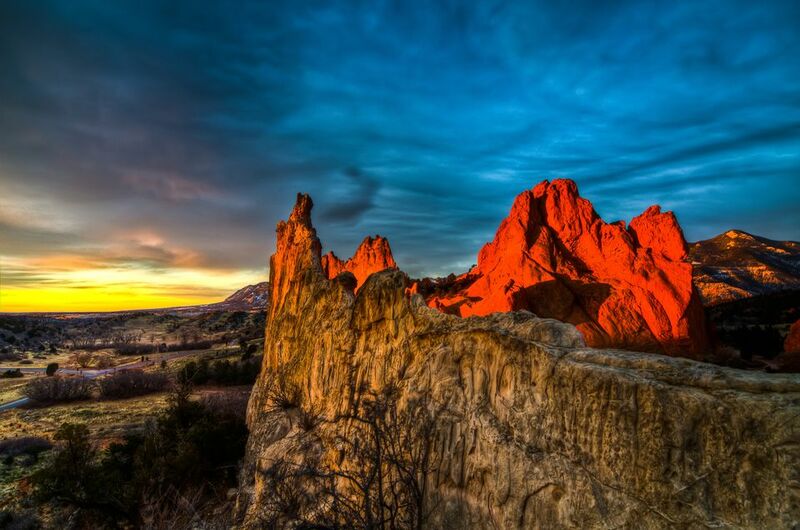 Colorado Springs boasts more than 55 attractions, and we’re not talking tiny pitstops. This city is home to one of Colorado’s most astonishing natural features, the Garden of the Gods, ancient cliff dwellings and the state’s first ever indoor water park resort. Add this all up and you’ve got one of the most exciting destinations in Colorado for families. Although it’s impossible to narrow down, here are 10 things you don’t want to miss in Colorado Springs. Colorado Springs is home to the state’s first indoor water park resort, the Great Wolf Lodge. Since opening in 2017, it has already become a major attraction for locals looking for a staycation, as well as a big draw for families landing in Denver. The highlight here is a large, indoor, kid-appropriate water park with tons of slides, a wave pool, water games and more. When your fingers get wrinkly from too much water, you can challenge yourself on a ropes course and mini golf or relax to storytime and craft-making. While here, the best place to eat is at Barnwood. (There are several dining options in the resort to make things easy.) Barnwood is way more than hot dogs and fries. The goal here is healthy, ​sharable meals that are still kid-friendly but also exciting to the grown-ups, such as street tacos, pan-seared Colorado trout and baked goat cheese dip. After a night at the busy Great Wolf Lodge, you’ll be ready for some luxury and peace. The Cheyenne Mountain Resort has that covered. Get a spacious room with a balcony offering direct views of the mountains (including mysterious Norad) and private golf course. Cheyenne Mountain Resort is stretched across 217 sprawling acres right in the heart of the city. It even has its own private lake with a swim beach. Also on site: the top-notch Country Club of Colorado, which outdoes any fitness room in any other hotel we’ve stayed at in Colorado. An absolute must-do at the Cheyenne Mountain Resort is to indulge in the champagne brunch on Sunday at the Mountain View Restaurant, aptly named for its entire wall of windows facing the mountains. This award-winning brunch has everything from meat carving to prime rib to macaroons. The selection is extensive. Wash it down with a mimosa. Grab a coffee at the Cheyenne Mountain Resort’s cafe and then head for a stroll through the country club, down to the newly renovated Alluvia Spa and Wellness Center. Inside, there’s a smoothie bar, where you can grab a healthy, green smoothie to take with you to the spa’s private, outside patio with a fireplace (of course, with a mountain view). When you’re sufficiently relaxed, try the 80-minute espresso mud body treatment. If you think you like drinking coffee, you’ll love being covered in it, head to toe. Turns out, the espresso mixture is great for exfoliating and nourishing the dry skin in Colorado’s climate. End your treatment with another unique feature: a tea bar with remedy-based teas designed to be mixed and matched with various tinctures and fortified kinds of honey. Follow the guidelines to hand-make a cup of healing tea to meet your unique needs. Need an energy boost or a stress detox? Glowing skin or better sleep? There’s a tea for that. Imagine exploring Colorado’s nature and stumbling across a hole in the mountain. Now imagine if you peeked inside that hole and realized it was the entry to an entire, elaborate series of naturally occurring underground caves. That’s how two brothers discovered the Cave of the Winds in the late 1800s. Today, you can take a guided tour through this remarkable, 500-million-year-old underground world lined with stalactites and stalagmites and curious rock formations. You’ll even get to experience “cave darkness” when the guide flips off the flashlight for a moment. This is total darkness, deep beneath the Earth, where no natural or ambient light can penetrate. It’s trippy. Feeling brave? Sign up for the ghost tour. As if that’s not enough of an adventure, the Cave of the Winds also offers a handful of thrilling rides above ground, including the Wind Walker (an obstacle course perched on the edge of a 600-foot cliff), the Bat-A-Pult (a zipline that flings you across the valley 1,200 feet above ground) and the Terror-Dactyl, which launches brave visitors 150 down into the guts of the canyon at nearly 100 miles an hour. It claims to be the first of its kind anywhere in the world. The Garden of the Gods is one of Colorado's most astonishing natural features, and you can visit it for free in Colorado Springs. This National Natural Landmark looks like it’s on another planet — nearly defying physics. It’s a series of red rock formations, created along a fault line millions of years ago, that were ultimately tilted vertically during the formation of the Rocky Mountains and Pikes Peak. What now remains is a crazy assortment of unusually shaped and perched rocks, some balanced, others slanted, and all telling the story of the region. The human history of this region is rich, too. There’s evidence of Native American life here dating as far back as 250 BC. For a lesser-known, local tip, after viewing the rocks, head to nearby Manitou. In this adorable, little town, you’ll find a penny arcade packed with vintage games. It’s cheap, old-fashioned entertainment, and kids (and hipsters) love it. The Cheyenne Mountain Zoo has been named one of the best zoos in America, and it totally lives up to the hype. This is the nation’s only mountainside zoo, perched at 6,800 feet above sea level. A highlight is the giraffe exhibit, where you can buy an inexpensive handful of lettuce and hand-feed it to the giants from atop a bridge that brings you eye-to-eye with these dramatic, gentle giants. The zoo is a full-day experience, with more than 750 types of animals and 150 different species, including more than 30 endangered animals. The zoo works to protect endangered species both in-house and by raising money for conservation. A portion of ticket sales goes toward the cause. The zoo’s history is pretty quirky, too. It was started in the ‘20s by a man named Spencer Penrose, who also is the founder of the Broadmoor hotel in town. Remembered as an unusual character, he had actually been collecting exotic animals of his own, as pets, but finally opened them up to the public. It’s now a nonprofit. Other stars here include free-range wallabies just walking around (er, hopping around) next to the visitors in the Australian exhibit. You can also hand-feed parakeets and cockatiels in a beautiful, bright bird house. Even if you don’t like snakes, make sure you visit the Scutes Family Gallery, which has to be the most exquisite reptile exhibit in the world. It’s designed as a high-end, modern art gallery, and the snakes, turtles and lizards live among the sculptures, ceramics and artwork. It will totally rewire how you see reptiles and make a snake-admirer out of just about anyone. Lesser-known, local tip: After seeing the animals, drive through the zoo to the overlook by the Will Rogers Shrine of the Sun (included in admission). At this unusual tower and chapel atop Cheyenne Mountain, you can score some of the best views in the city. Here’s a fourtneener you can summit without having to hike it. Colorado has 53 fourteeners, or mountains that are taller than 14,000 feet above sea level. Many, like Longs Peak, require great fitness, planning and good gear to conquer. But you can stand on top of Pikes Peak without having to break a sweat (although fair warning: the air is still thin up here and can make you huff and puff). Pikes Peak is the most visited mountain in North America and attracts more than a half a million visitors every year. There are several different ways to get to the top of Pikes. You can hike up Barr Trail, if you want to make it “count” among the climbers. Athletes can also attempt Pikes by bike. For less exertion, you can take your car up Pike Peak Highway and enjoy the views along the way. Or for the route that’s especially popular among tourists, try the Broadmoor’s Pikes Peak Cog Railway. This is the world’s highest cog railway and has been open year-round since the late 1800s. This is no ordinary train. It’s built to handle a pretty dramatic grade, sometimes as steep as 24 percent. So even though it’s relaxing with serene views, you’ll still feel the thrill. Seven Falls has been called the “grandest mile of scenery in Colorado.” It’s more than just a waterfall (although the series of waterfalls culminating with a dramatic 181-foot water cascade is attraction enough on its own). This Broadmoor-owned destination also features a fine restaurant with patio seating, shopping, hiking trails, gold panning, zipline tours and mountain streams. Take the free shuttle from the Broadmoor hotel (you will have to buy entry into the park itself) and spend a morning taking in some of Colorado Springs’ best views. This is airplane food you’ll actually want to eat. In a military town, it’s only fitting to find an old airplane converted into a quirky restaurant. Solos Restaurant, better known as The Airplane Restaurant, is a popular, casual dining destination where the seats have been converted into booths and tables aboard a fully intact 1953 Boeing KC-97 tanker. Forty-two lucky “passengers” get the on-board seats (and kids can play in the cockpit until the food arrives), but there are other tables in a much bigger, attached restaurant that’s decorated with airplane paraphernalia, pictures and rare artifacts. The restaurant itself is an aviation museum. Food here is nothing fancy, but really, you’re paying for the atmosphere. It’s good, ol’ comfort food: juicy burgers and fries, sandwiches and even Barrel Rolls (named after the airplane rotation), which are tortillas stuffed with chicken, peppers, cilantro, cheese and a dash of jalapeno. If you don't know what Rocky Mountain Oysters are, uh, we aren't telling you. Just try them. They're not that bad. OK, fine, we'll break it to you. They're bull testicles and a staple-slash-dare of the region. Find them at the Elevations Lounge inside the Cheyenne Mountain Resort, a cozy sports bar with a monstrous TV and pool tables. Not only can you order a plate of not-oysters, but you can also find other adventurous options, including salsa made with ghost peppers that will burn our soul out. Wash it down with a local beer Phantom Canyon Brewing made especially for the resort. The beer, called 6035, is named after the elevation of Colorado Springs.